A book that came out several months ago, amongst the flurry of books that came out in September 2015 in the lead-up to “The Force Awakens”, fills in some interesting information prior to “Return of the Jedi”. 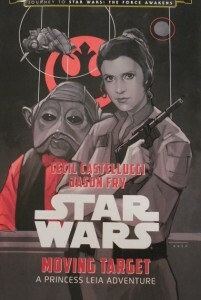 Written by Cecil Castellucci and Jason Fry, “Moving Target: A Princess Leia Adventure” is primarily about a mission that Princess Leia undertakes prior to “Return of the Jedi” in order to draw away Imperial attention from Rebel ships amassing to try to take out the second Death Star. Having heard Castellucci speak in the fall at Long Beach Comic Con, I had some curiosity about the book, so I finally got around to reading it recently (having purchased it pretty recently). While the Prologue and Epilogue take place before “The Force Awakens”, they are not significant to it (although there is a couple of interesting lines from General Leia about Poe Dameron: “He’s old enough to hear me, but not old enough to listen yet. I’ll keep trying.” (230) and “I’ve never worried about Poe’s commitment. My worry is for what that commitment may cost him.” (230)). Ackbar signaled to a technician in the corner of the room. The lights dimmed and a hologram shimmered to life. Leia stared at it in puzzlement. It was the Death star, complete with the superlaser dish that reminded Leia of a vast, baleful eye. But huge chunks of the battle station were missing, with skeletal fingers of metal outlining the full sphere. That was the site of the rebels’ now-abandoned base. Had the Empire somehow rebuilt the battle station from the fragments left behind? “An old holo, then,” said General Madine. Leia nodded, annoyed that she couldn’t figure out what she was looking at. Perhaps the Empire was trying once again to resurrect the superlaser technology, to build a new kind of planet-killing weapon? She scanned the other rebel leaders’ faces. From her experience as a diplomat and politician, she could immediately tell who had seen that holo before and who hadn’t. Madine looked shocked, and Rieekan had his chin cupped in one hand. But Mothma, Ackbar, and Cracken were quietly waiting for the others to get over their surprise at what they were seeing. Leia looked at the military leaders around her. Their faces were grim masks. She felt like she was in a waking nightmare and barely registered the details Ackbar was providing. Larger diameter. More powerful superlaser. Advanced specifications. Leia knew the Alliance was in no shape to take on another Death Star. Yes, the rebels had gained allies in the fight against the Empire, but the fleet was dispersed – rather than battling the Empire for control of the galaxy’s star systems, the rebels were simply trying to stay alive. The first Death Star had taken decades to build, at astronomical cost in credits and resources and lives. By destroying it, the rebels had struck a powerful blow against the Imperial war machine. But the Emperor had simply constructed another one. Against such enormous power and wealth, what chance did they have? “So we destroy this one, too,” Madine said. “Admiral Ackbar is right,” she said. “The Death Star isn’t our only enemy – time is, as well. Our attack must come before the battle station is operational – or all will be lost. So, the shuttle Princess Leia steals (with Nien Nunb piloting) is the same one used to ferry Han Solo and the rebels to knock out the shield generator on the forest moon of Endor in “Return of the Jedi”. Also, what Luke tells Leia here is fascinating in that Luke provides her with the intel about Han Solo’s location. 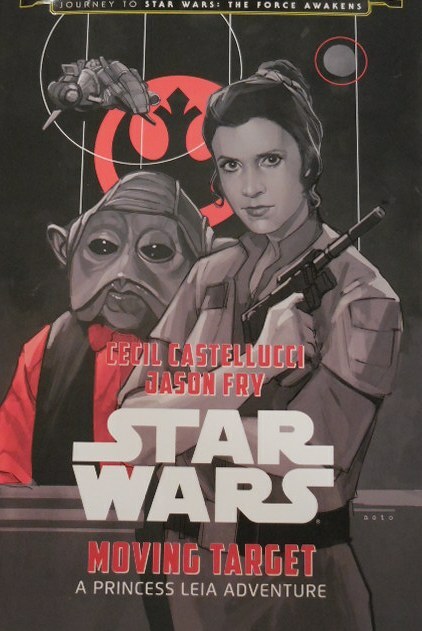 I think that what I greatly appreciated about this book is that it provides us with an understanding of these twin situations – both the Han Solo issue and the Death Star II issue – and how Princess Leia is navigating them at the same time. If we see the rebels coming together in “Return of the Jedi” to strike Death Star II, why is Leia off trying to free Han Solo? This book provides some insight into that.